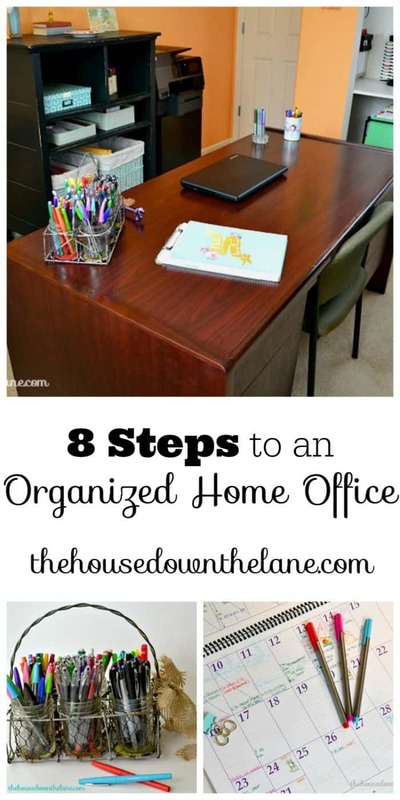 Maintaining an organized home office doesn’t have to be a boring, arduous process. It can be done in 8 simple steps! 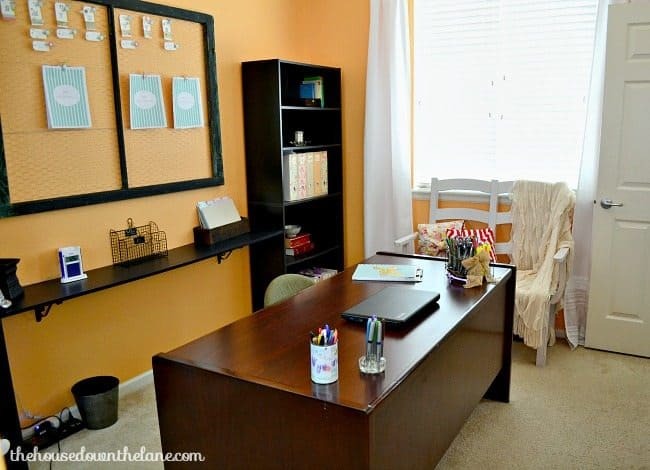 An organized home office will save you time, frustration, and help you to be more productive. 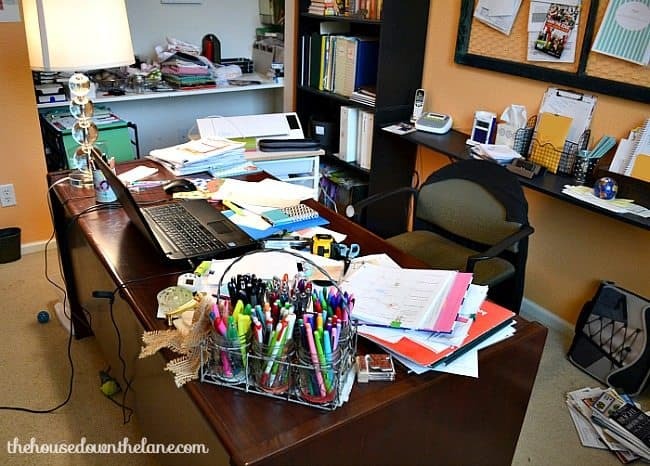 Think about the times you’ve walked into your home office (or wherever you work at home) and you were greeted by piles of papers, writing utensils strewn here and there, remnants from some craft project, more paper piles, scribbled notes on little pieces of paper, file folders, your kids’ permission slips. Basically, it’s total and utter chaos. 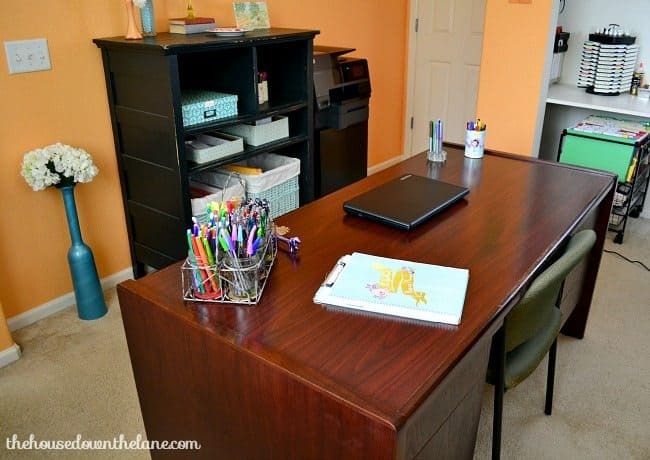 Now, think about the times you’ve walked into your home office (or wherever you work at home) and a sparkling clean and decluttered work space is waiting for you! Everything is in its place, your to-do list is neatly written and awaiting your check marks, your client or project files are in a neat pile. Your work space is ready for you and you’re ready to get to work…. Now, we’re talking! Just by having your work surface cleared off, you’ve set yourself up for success! So clear your desk off regularly. I like to clear my desk every afternoon/evening before I call the work day done, but it might work better for you to do it at lunch. Obviously, I don’t recommend doing it in the morning. Find what works for you and rock your work day! Creating office zones makes your office more organized and helps to keep it that way! Remember, earlier when I mentioned the craft project remnants? If you have office zones set up, you won’t have to worry about those craft project leftovers. Office zones are set up based on the type of task that will be completed in each area. I’m lucky enough to use an extra bedroom in our house as my home office. I have a desk zone where I do my computer work and blog post writing. I have a creative zone that’s set up in my closet. It’s where I do my crafting and creating. The craft supplies that I use on a regular basis are stored here, so everything is within reach. 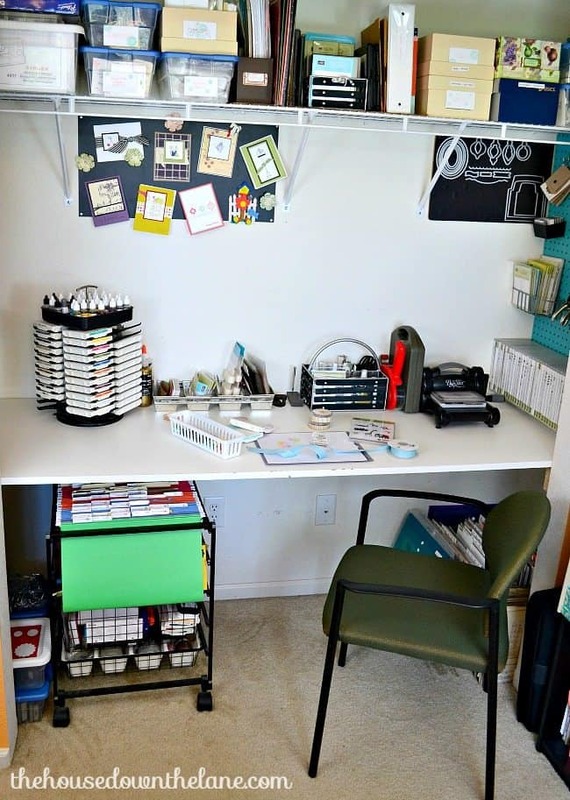 You can see how I squeezed a craft room into a closet HERE! I made over another closet in our house recently. You can see it and all of the DIY projects involved here! I also have an information zone which includes my bookshelves and the books and notebooks that I access on a regular basis. 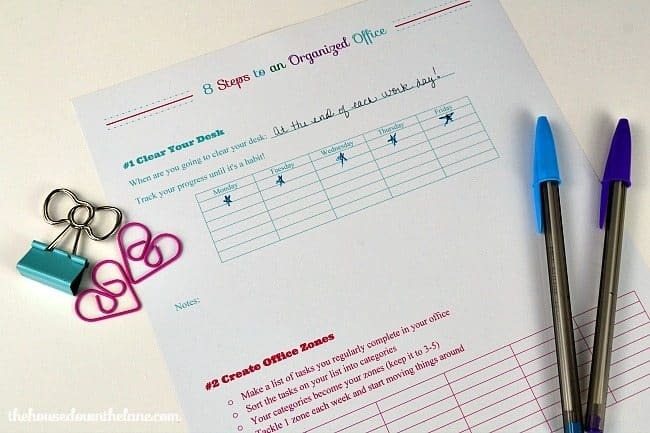 Besides creating a more efficient and organized office, the other great thing about office zones is that you can declutter one each week (see step #8 below), which keeps the process from feeling overwhelming! You’ve probably heard this organizational nugget before, and it’s as applicable now as it was back in the day. I’m a messy worker (as you’ve already seen). I spread out and pull out tons of supplies and papers and folders. But when it’s time to straighten up, it only takes me a few minutes, because everything has a place. 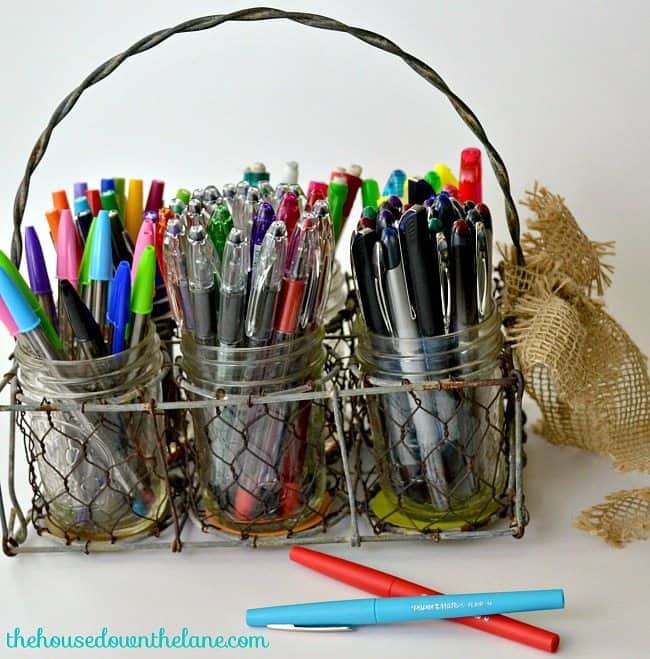 If you’re looking to corral some writing supplies, here’s an easy DIY project that might help! And if you want to create your own tab dividers, check out this tutorial! 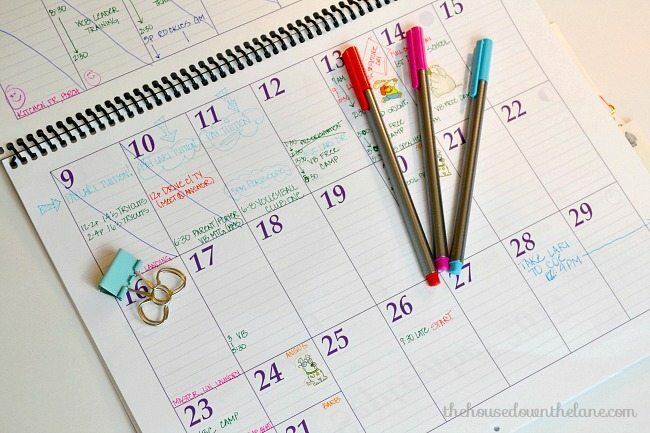 Your calendar isn’t just for birthday parties, play dates, and appointments. Anything with a deadline can be recorded on your calendar. I use mine to track my regular to-dos, household chores, phone calls, check-ins, and many other things. Of course, you also have to get in the habit of checking it regularly. I try to check mine on Sunday evenings when I’m planning my week, in the mornings, at lunch time, and before I head to bed. It seems like a lot, but with just a quick glance, I know exactly what has to be done, where I need to be, and what’s coming up in the near future! 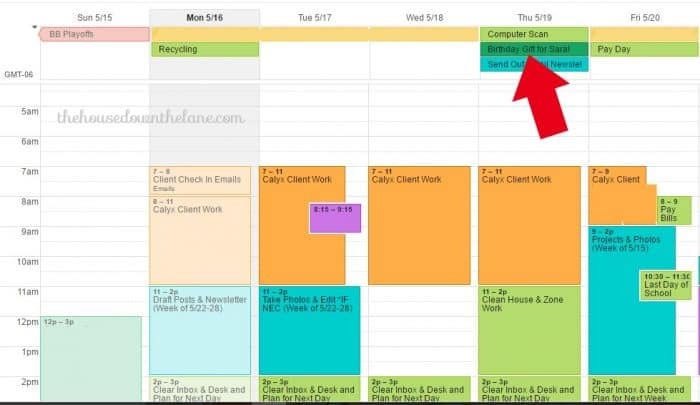 You can learn more about making your calendar work for you here! No, I’m not talking about the 30-second rule that’s used to judge whether food that’s fallen on the floor is still okay to eat (btw, yuck!). I’m referring to the yardstick for knocking those quick to-dos out right here and now! You’re dealing with the mail and open up a birthday party invitation for your youngest daughter. Do you stick it in a pile to deal with later (and inevitably miss the party and have a disappointed gal? Been there, done that)? Or do you record it on your calendar right THEN? If it will take you less than 3 minutes to complete, listen to Nike and just do it! Here’s a Bonus Tip for you: staple or clip that party invitation to the back of the month during which it’s taking place, so that you’ll know where you’re going and what your daughter’s friend wants for her birthday! If I had to choose one step on this list for you to tackle first and foremost, this would be it! You’ll be amazed by how much smaller and unclunky (yes, I just made that word up) your to-do list is and how much more organized you are. Want to learn more about how to use your calendar more efficiently and effectively? Check this post out: Add Hours to Your Day with One Simple Tool! 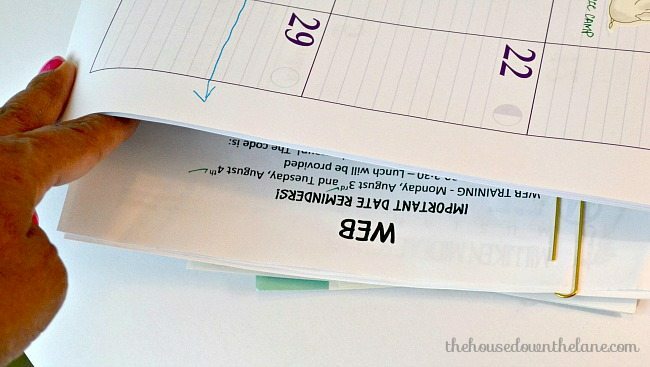 A tickler file is an old school way to organize to-dos, papers, and long-term projects. It’s basically a file box with labeled hanging folders. 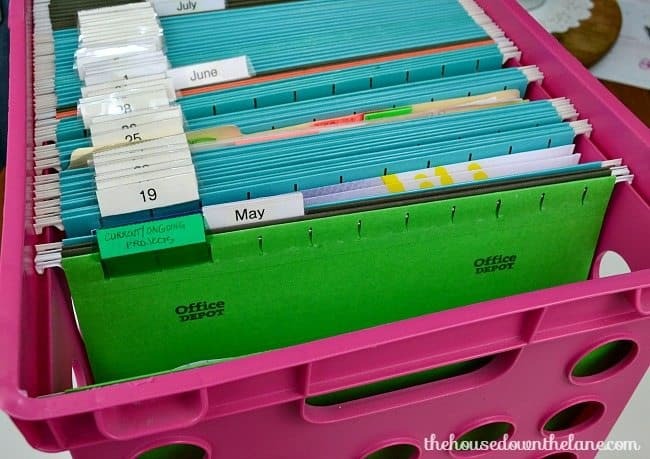 Some people label their hanging folders with the months and organize that way. I like to use mine for ongoing projects along with the information that goes with them, my multiple inbox system, and to-dos. Stop by The House Down the Lane next week for a more detailed post about the Tickler File. This step goes right along with the one above! You open that birthday party invite, walk straight to your calendar, record it, and clip the invite to the back of the month, and you’re DONE! You don’t have to worry about that party or that piece of paper AGAIN until it’s time to shop for a gift and actually go to the party. Bonus Tip: Add an event to your calendar that will remind you that you need to purchase a birthday gift! I like to add my gift shopping reminders the Thursday before the week of the party, so that I have a weekend during which to shop! How many times do you shuffle papers that you could have handled at once or maybe in two quick steps? For me, it’s hundreds of times! I’ve had a certain pile on my desk for months, because I didn’t follow the 3-Minute Rule and this step. If your office is anything like mine, it becomes a dumping ground anytime your family shifts into crisis cleaning (i.e. 10 minutes before unexpected guests arrive). So, work in a regular time each day or each week to clear the clutter! I usually spend 15 minutes at the end of the work day on Monday and/or Friday decluttering. Here’s a FREE printable that will help you implement these steps and track your progress! And that’s it! If you implement and follow these 8 steps you’ll be able to get your office organized and keep it that way. You’ll also feel less stress, save time, and get more done. Which will leave more time for your family and a little fun! Hey, I’m Tiffany! When I’m not regaling you with tales of my crafty adventures (and misadventures), I’m hanging out over at The House Down the Lane sharing all things DIY, home decor, organization, and family! Pop on by and see if you find something you like. You can also find me on Facebook, Pinterest, and Instagram.